You can still help at Heat Respite! We are in the final phase of Heat Respite 2018, but we are still going strong! Nothing, not even the heat or monsoon, can stop us or our volunteers or ministry partners! Our ministry partners supplied us with so much water, we are overstocked. That enables us to provide water for other hydration stations in the valley. We already donated 4 pallets to Saint Mary’s Food Bank, 1 pallet to Bible Baptist Church, and 2 pallets to House of Hope. Thank you! On August 17 we had 32 foreign exchange students from all over the world helping in the kitchen, the Grace Room, and in Hope Hall. They are studying at the Scottsdale Community College and are part of a state funded exchange program. Thanks for helping and good luck with your studies. We are planning to have another raffle for our participants on August 31, the last day of Heat Respite. We still need more prizes. We have Starbucks gift cards and are looking for giftcards for stores in our neighborhood, like Safeway, Circle K, McDonalds, etc. They should be maximum $10. If you have an extra backpack or duffel bag that you don’t use, please consider donating it for the raffle (it would be our grand prize!). On September 2 we will have our Volunteer & Donor Appreciation. If you volunteered with or donated towards the Heat Respite this year, you are invited to the Volunteer & Donor Appreciation event. If you have any questions about the raffle and when/where to drop items off, or to RSVP for the Appreciation event, please contact Sven at (602) 551-9234 or email at outreach@graceinthecity.com. Last Sunday I went to New Covenant Lutheran Church In Scottsdale. They are our biggest donor of water this year. Even with a relatively small number of active members (just about 300), they manageged to donate 600 cases (24,000 bottles) of water so far and raised already enough money to be able to donate another 98 cases every Friday until the end of August. And, to top it all off, they already started a designated fund for Heat Respite 2019! What an amazing congregation! Thank you so much!! Everyone I met was very appreciative and supportive of our mission to provide our less fortunate neighbors with a safe place during the day, water and food! A big THANK YOU goes out to Bill Cope, who takes time out of his busy schedule running a small bussiness. Fridays is his only day off, yet, he still drives down from North Scottsdale to deliver the water to us. During the last week we saw a rising number in attendance. We went from about 150 per day to nearly 200! That means our Grace Room is running out of supplies really fast! We need shorts, socks, underwear, tshirts, pants, small (travel size) hygiene items, bags (duffel bags, back packs), shoes, sandals, flip flops, belts. If you have anything extra, please consider danating to the Grace Room. Thank you. Also, a big thank you to Jeff Jirele. He drives every Thursday to Midwest Food Bank in Gilbert to pick up supplies for our kitchen. Not only do we have amazing ministry partners, but we also have an amazing staff at Grace. Here are just 2 examples. Lester Andrews, the caretaker at Grace, is there whenever something is needed, whether something is broken, a whiteboard needs to be hung, we need a quick Costco run, or someone needs to pick up bus passes. Adrienne Kaye, the office administrator, keeps all the paperwork in order, answers calls, and even takes in donations. All together, the staff of Grace with Pastor Sarah Stadler in the lead, is supportive in every way they can be to make this programm run the way it’s supposed to. Thank you!!!!!! On August 31, the last day of Heat Respite, we're having another raffle for our attending clients. We are asking for gift cards (maximum $10), bus passes, maybe even a backpack for a grand prize. If you want to donate something for the raffle, please drop it off at the office during bussiness hours, directly at Heat Respite at Hope Hall, or hand it to Pastor Sarah or Solveig Muus on Sundays after worship. If you have any questions, need a special time to drop donations off, or want to volunteer at Heat Respite (we still have 4 weeks left), please contact me at (602) 551-9234 or email at outreach@graceinthecity.com. The volunteers said they would do it again in August. We can’t wait! On July 25, 20 volunteers from Saint Mary’s Basilica prepared lunch. They made meatballs from scratch, cooked spaghetti, prepared garlic bread and salad. But if preparing wasn't enough, they also served the food! That is quite a difficult job, if you consider there were about 150 hungry stomachs waiting to be fed! But these good people were so amazing and managed it all! Thank you! Grace Youth is giving to the community! Not only do we get help from volunteers from outside of Grace, but also our own youth stepped up. We do have some amazing kids! These young adults just graduated from high school and are getting ready to go to college! But still they take time to serve our neighbors who experience homelessness! On July 26, six of our own recent high school graduates prepared a tasty lunch of hamburger, fruit and vegetables. Thank you Grace Youth, and supervisors Andrea Sigala and Marlene Haller. During the last few weeks our attendance has been steady at approximately 175 people per day. While everyone comes for food and water (we use 20 cases, approx. 480 bottles per day), not everyone stays to enjoy the daily movie, or a relaxing afternoon in the cool, 76-degree atmosphere of Hope Hall. Yes we feed, and we offer community, and a little entertainment in the cool, but that's not all. In our small way, we also are educators. Organizations like Terros visit regularly to perform free HIV tests. Our friend Vonda Bennett is here every Friday to provide resources on jobs, housing, medical, etc. Vonda shared with us that she was herself homeless in our neighborhood for two years, and made use of the resources the city had to offer... now she’s giving back to the community. We are grateful to have received donations from all over the valley, from Gold Canyon to Sun City West. Thanks to all of our amazing ministry partners -- we can’t do it without you!! On Sunday, July 8, Sven visited pastors Glenn Zorb, Annemarie Burke, and Chris Heller at Mountain View Lutheran Church in Ahwatukee, to thank them and their congregation for their unbelieveable contribution of water (400 cases!) and very generous cash donation. That is really a great accomplishment by one congregation! Everyone he met was so kind and encouraging of our ministry. Blessings to all our friends at MVLC! Sven and Paul are also so very grateful for the amazing group of volunteers who donate between 6 and 12 hours every day to the summer's Heat Respite program. If you are interested in volunteereing or have questions about how or what to donate, please call the church office or email us. UPCOMING EVENT: We are planning another raffle at the end of Heat Respite on August 31. We will raffle gift cards ($10 max, Starbucks, McDonald’s, Circle K, etc. ), bus passes, etc. If you want to help with the raffle, please contact us. An eleven member LWLM team from Trinity Lutheran Church (Fountain Hills) recently purchased supplies for 220 sack lunches that included ham and cheese sandwiches, potato salad, bananas, cookies and a soft drink. Team members included Amy Heuer, Ann Seward, Christine Colley, Diane Arnett, Debbie Olson, Grace & Darryl Kahl, Jan Visser, Kim Caputo, Linda Swanson and Morgan Visnaw. Funds for this program were raised from a successful garage sale at the church. The team prepared the sandwiches at TLC and a group of five delivered and served the meals to the hungry that visited Grace Lutheran Church in Phoenix that day. There were enough sandwiches for second helpings for everyone. It was over 100 degrees outside and our gift was most appreciated by all. We toured the facility and visited the beautiful church (the oldest Lutheran Church in Arizona) as well as their clothing room where all donations are sorted and made available to those who need them. Most items desired are men's jeans size 36 or smaller, t-shirts, personal care items, games and books. Grace Lutheran Church opens their doors during the summer Monday to Friday from 8 to 5pm to provide a cool place for rest and relaxation. A breakfast, lunch and afternoon Snack are served, cool water is always available. Volunteer groups provide most meals and the church fills in gaps from cash contributions when needed. It was a rewarding experience to assist in this worthy effort. "Grace Lutheran Heat Respite Program’s mission is to provide a space for heat relief while building community through the sharing of community resources, meals, water, and ourselves in a place of being, belonging, and becoming." 2018 Heat Respite in Full Swing! The third week of Heat Respite is complete. This week our team served nearly 1,000 people, approx. 200 per day. We gave out more than 1,500 bottles of water, served over 2,000 meals (breakfast, lunch, snacks) -- a big Thank You goes out to our amazing kitchen crew: Marlene, Lori, Devlin and Frank -- but we can't do it alone. We also had volunteers including Anne Gardner, Brent and Sarah Smith, and volunteers from Trinity Lutheran Church in Fountain Hills. This was Trinity's first service at Grace, so a special thanks to them for bringing 225 lunch sacks, 225 servings of potato salad, and 228 bottles of soda! What does 'Heat Respite' mean to our participants (some names changed)? If you think you can help out in some way to support this program, want to donate, or just spend some time with our participants, there are many opportunities to do so. Just give us a call at (602) 551-9234 (Sven) or (480) 388-0225 (Paul), or email us at outreach@graceinthecity.com. Many of you celebrate the 4th of July with friends and family and barbeque. 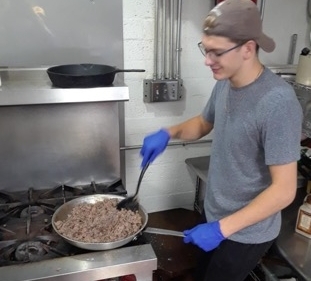 For many of our participants the people around them are their family, so together with Trevor's Vision, a non-profit organization from Peoria that hosts a meal every Thursday evening in our Hope Hall, we're planning a family-style B-B-Q for our community. The menu includes bratwursts from 'The Proper Beast' (a local Gilbert business), vegetables & salads, drinks. If you want to help out, have any time to spare, or have chips or other easy to hand out items, anything would be appreciated. Also, if you want to swing by and listen to a harmonica solo, or short comedy routine, please join us! We're sponsoring a drawing at the halfway point of Respite (Friday July 20). We're looking for much needed bus passes (full or reduced fare), gift cards (Circle K, Subway, McDonald's, Einstein Brother's, Safeway, etc.) -- please help if you can! Maximum $10 cards. Books, Bibles, crossword puzzles, Sudoku, chess sets, etc. Any donation is welcome, big or small! At Grace, We Are In The City For Good and Heat Respite is doing that on a daily basis! For the first two weeks in June, we had 1,451 entries for our program, including 1,235 volunteer hours -- that’s almost double the volunteer hours from last year! We have had some great volunteer groups donating their time, meals, water, and financially supporting our program. We could not do this program without all of your help, so thank you very much! Ray Saunders, and many others! We also had several groups donate food for lunches as well as volunteer their time with us. We are so grateful of their time and talents! Also, thank you to Veteran’s Hands in Action, Phoenix, and Our Savior's Lutheran Church, Mesa, for donating snack items several times over the past 2 weeks. If you are interested in volunteering or donating to the Heat Respite Program, please contact Sven Lenkewitz at (602) 551-9234 or Paul Hansen-Mitev at (480) 388-0225, or email us at outreach@graceinthecity.com to discuss opportunities available for you and/or a group! Any donation will help and is greatly appreciated. As I reflect on the past several months, I would like to say it has been an honor and a privilege to be a part of the team here at Grace In The City, directly serving primarily those experiencing homelessness, overseeing this summer’s Heat Respite program. As I’ve gotten to know many of our guests one-on-one, I am reminded that each of us has our own unique stories of how we got to where we are today, and how to make changes for our future. This experience for me has truly been life changing. We welcomed 10,816 visitors over 12 weeks -- nearly the same as last year's count -- and total volunteers (counting each person each day) numbered 997, for a grand total of 11,665 souls. It took 4,571 volunteer hours to make it happen. The big numbers may be attributed to the higher than normal heat this summer, the Burton Barr Library closure due to water damage, the stronger enforcement of the city’s loitering and camping laws, and a host of other outside forces. Whatever the reason, our guests were so appreciative of Grace’s hospitality and generosity, sentiments we heard every single day. As Heat Respite 2017 draws to a close, I offer heartfelt thanks to those who made this program a success -- without the incredible continuing support of our ministry partners, friends and neighbors all, Heat Respite at Grace doesn't happen. Last, but certainly not least, I like to thank the wonderful team of volunteers we had one site, some nearly every single day. The old adage “it takes a village” certainly is true with Heat Respite, and it is physically (and even emotionally) impossible for one person to do this program solely on her own. Again, thank you for this wonderful opportunity to be a part of this wonderful program. I look forward to being a part of Grace Lutheran Church for a long time to come. Looking back, being the Outreach Coordinator has been one of the most rewarding as well as challenging positions I’ve ever had, and I will be forever grateful. A cool story I learned this week that I wanted to share about Greg Silva, one of our steady volunteers who typically oversees the water and cleans up every day. Greg let it be known by accident (through another conversation) that he gave up his worldly processions to be a community member and is volunteering at Grace as part of his personalized two-year service project towards his Fourth Degree Sword in the Knights of Columbus as a Roman Catholic. He chose to do this particular "difficult and hard" project to be of charity to others and more importantly, to humble himself before God. He showed me his paperwork, asked me to provide some documentation for this part of his journey, which is over in a few months. He goes home to Chandler every other weekend to see his family, and when I asked him what his family thought of this project he came up with, he said that while they are scared of him being on the streets, they are also very proud of him. I told him I am too. I love how Grace draws so many different people to it's ministries, and Greg's story is unique as is every else's here. At Grace, we are In The City For Good and Heat Respite is doing that on a daily basis! For the first two weeks in July, we had 1,657 entries for our program, including almost 650 total volunteer hours. We celebrated the 4th of July with a special holiday lunch prepared by St. Mary’s Basilica. We have had some other great volunteer groups, donating their time, meals, water, and finically supporting our program. We could not do this program without all of your help so thank you very much! We also several groups either donate food for lunches as well as volunteer their time with us. We are so grateful of their time and talents! Also, thank you to St. Andrew Lutheran Church, Phoenix, and Our Savior's Lutheran Church, Mesa, for donating snack items several times over the past several weeks. If you interesting in volunteering or donating to the Heat Respite Program, please contact Kim Davidson, Outreach Coordinator, at outreach@graceinthecity.com or at 602-651-1182 to discuss opportunities available for you and/or a group! Thank you and God Bless. We have had a great first two weeks of our Heat Respite Program. We had 1,898 entries for our program, including almost 700 total volunteer hours. We spent most of the first two weeks under an Excessive Heat Warning, with a nearby sign reading 125 degrees on Tuesday the 20th! Obviously, we’ve had our “speedbumps”, but we got through them, never stopping to strive to be In The City 4 Good and always working towards the Heat Respite Program’s mission to provide a space for heat relief while building community through the sharing of community resources, meals, water, and ourselves in a place of being, belonging, and becoming. Also, thank you to St. Andrews Lutheran Church for donating snack items several times over the past several weeks. ASU and Luke AFB Team Up for Heat Respite! A wonderful group of primarily active duty service men and women from Luke AFB and some students from ASU visited us at Heat Respite today. The Commander of Luke AFB arrived shortly after 9am and stayed 2 1/2 hours, putting himself and his leadership team to work. What began as a "small" group of about 25, turned into 60-70 volunteers! The team cleaned up storerooms, cleaned up the surrounding neighborhood, helped with the Heat Respite program at the registration desk and in the kitchen... It's amazing what the group accomplished all over the property! The group from ASU is the Next Generation Service Corp (NGSC) through the Public Service Academy in the College of Public Service & Community Solutions (COPSCS). "The NGSC is a four-year leadership development program (with a two-year transfer track) where students study their chosen major, engage in practical elements of leadership, learn cross-sector collaboration and take internships each summer working on real issues in the public, private and nonprofit sectors all while pursuing their own chosen social mission. NGSC students train directly with ROTC cadets and midshipmen in leadership exercises and field training exercises. This is a recognition that civilian service and military service are really just two sides of the same coin; both make us stronger as a nation." The group from Luke was here for their #LukeServiceBlitz program. For more information on the combination of the two groups, visit https://psa.asu.edu/next-generation-service-corps. From Left to Right: Brett Hunt, Exec Dir of the Public Service Academy at COPSCS/ASU; Kim Davidson, Heat Respite Coordinator; Brigadier General Brook Leonard, Commander of the 56th Fighter Win/LukeAFB, Anita Le, NGSC/ASU; and Lt. Col Rhett Hierlmeier, Dir of Ops for the 56th Operations Group/Luke AFB. One of our own, 16-year-old Trevor Hokanson is a Junior at Buckeye High School and a Life Scout in Boy Scout Troop 263. In order to achieve the highest rank of Eagle Scout he is required to complete a service project. Trevor is organizing an event on Friday, October 14 from 10:00am - 4:00pm to provide services to the disadvantaged in downtown Phoenix. He is looking for volunteers to help him serve up to 200 people. Volunteers will help guide the guests to make sure they make the most of the services provided. Some volunteers are needed for kitchen prep, serving, and clean up. There is still a need for volunteers who can provide haircuts. Any volunteers under the age of 16 will need to shadow an adult. Volunteers 16 to 18 need to use the buddy system. Lunch will be provided for all! Please click on this link to sign up as a volunteer! Eagle Scout is the highest achievement or rank attainable in the Boy Scouting program of the Boy Scouts of America (BSA). The designation "Eagle Scout" has a long history since its founding over one hundred years ago. Only four percent of Boy Scouts are granted this rank after a lengthy review process. The requirements necessary to achieve this rank take years to fulfill. Since its founding, the Eagle Scout rank has been earned by more than two million young men. Learn more about Boy Scout Troop 263 in Buckeye. As you can see, numbers increased steadily with the temperatures. Though the days will start to get shorter as we passed the summer solstice Monday, the heat does not seem to be leaving and we have seen this trend continue. Thank you to all our donation and ministry partners, with a special note to Desert Cross Lutheran Church for the donation of 4 pallets of water, totaling 988.65 gallons of water.